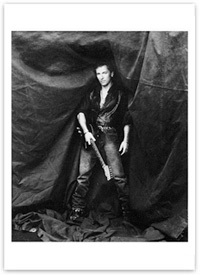 Photographer Herb Ritts shot this black & white image of Springsteen in 1992, and it's a good reminder that, despite other photographic evidence to the contrary, Bruce did look cool at the time. Officially licensed, from Fotofolio, Ritts' image printed on a 4” x 6” postcard. Use 'em as invitations, "Wish You Were Here" cards, wallpaper. Four postcards for $3.